The annual Stingers athletics awards gala was an opportunity for athletes, coaches, administrators, staff, and anyone else involved with the athletics department to enjoy a look back at the long seasons of every team and applaud the work that went into each of them. The Oscar Peterson Concert Hall at Loyola campus was nearly full, packed with the crowds of people that it takes to keep 12 university teams afloat. While mainly a night for handing out awards to Stingers athletes who excelled in one aspect or another of their lives as student athletes, the evening had the atmosphere of a night for sitting back and catching your breath after the grind of a long year. Laughter was a constant sound at the gala as jokes were shouted from the crowd as well as the stage. The mood was so high that team’s cheers often drowned out the announcement of who would be taking home any given award. Those awards often went to the more popular sports like football and basketball, but also were a chance to celebrate the accomplishments of teams that don’t always see as much of the spotlight like golf, baseball, and cross country. Teams both with and without varsity status found themselves represented in both their awards and the ceremony itself. The awards presented were not only for athletic achievement but academic accomplishments as well. The first awards of the night were President’s academic awards that went to wrestler Francis Carter and hockey player Alexandra Nikolidakis, both of which who boast GPAs above a 4.0. Women’s basketball’s Myriam Leclerc took home women’s basketball’s rookie of the year title, as well as team MVP and Stingers female rookie of the year. Nikolidakis is a physical therapy major and took home her third consecutive award as one of the most academically successful members of the Stingers. Carter is studying behavioural neuroscience and earned surprised cheers when his cumulative 4.29 GPA was announced. Perhaps the loudest cheers of the night were at the announcement of the Marvin Cooper award for perseverance. For the first time it was given to co-winners as Laetitia Royer and Ionna Kontogiannos were applauded for coming back from serious knee injuries requiring extensive rehabilitation. Awards followed for leadership, fitness, seniors who contributed heavily to the program during their time, and rookies of the year and MVPs for each individual team. A few athletes heard their names called multiple times. 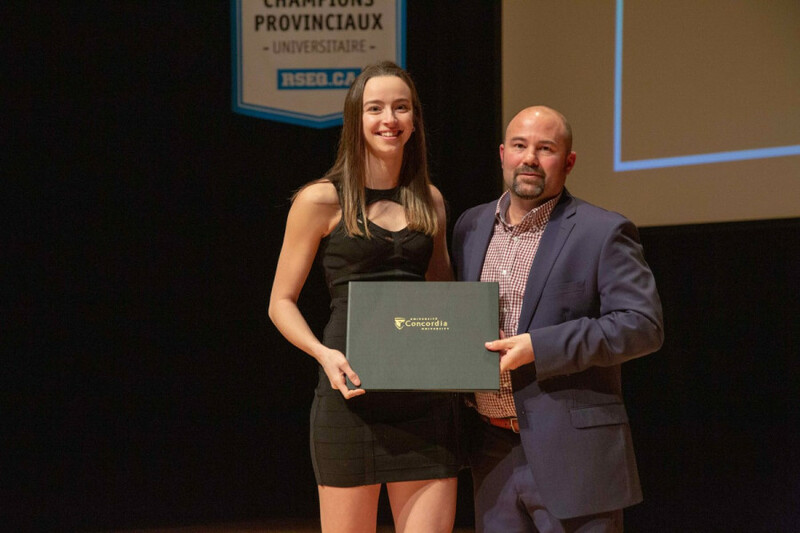 Myriam Leclerc of the women’s basketball team was named women’s basketball rookie of the year and team MVP, while also taking home female rookie of the year for the Stingers as a whole. Men’s hockey’s Hugo Roy, who couldn’t attend as he earned a professional contract and is in the U.S, took home male rookie of the year and men’s hockey rookie of the year. 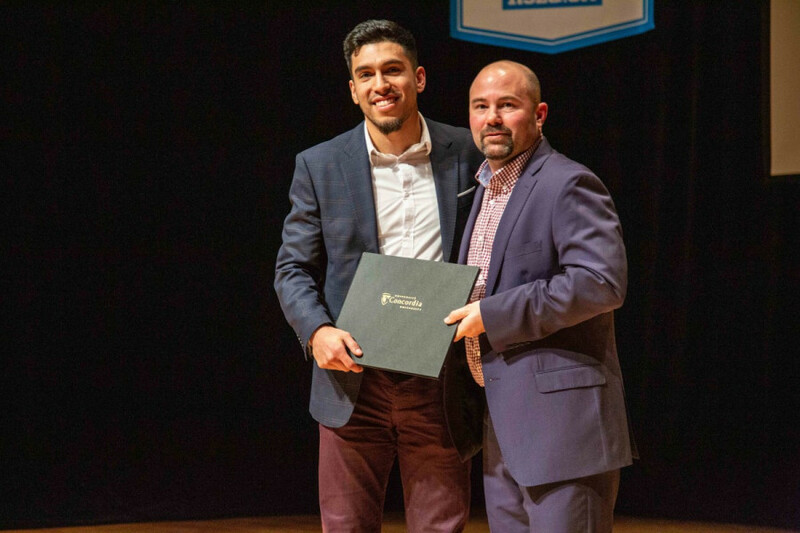 Graduating men’s basketball captain and Réseau du sport étudiant du Québec MVP Ricardo Monge was named team MVP, earned an award as a graduating player with major impact, and was named male athlete of the year. Jade Dufour of the women’s wrestling team was her team’s MVP and was also named Stingers female athlete of the year. Throughout the ceremony and cheers, the Stingers threw in some fun and laughter. Athletics director D’Arcy Ryan decided to do “a year in review” of the Stingers through a bit of standup accompanied by memes he had prepared. A collection of “dad style” jokes to go along with awkward or funny pictures of Stingers players got plenty of chuckles from the crowd. Athletes certainly also appreciated a live vote on play of the year, with a video of each team’s nomination and the voting results from an app on their phones being shown in the Oscar Peterson’s stage screen. A powerful spin move and basket by Areej Burgonio of the women’s basketball team would take home that particular honour. The night concluded with a speech and pair of videos by the Stingers valedictorians: Monge and soccer player Alexandria Ibaceta. The two praised the Stingers organization, took a few digs at each team and showed a video of “a day in the life of a Stinger” filled with in-jokes for their fellow athletes.